"Facing your mortality is life changing, facing it over and over is just f*****g torture. In the past eight and a half years I've had: two bone marrow transplants, total body radiation, many chemos, been on and off steroids, had every myeloma treatment available, and I'm running out of options." 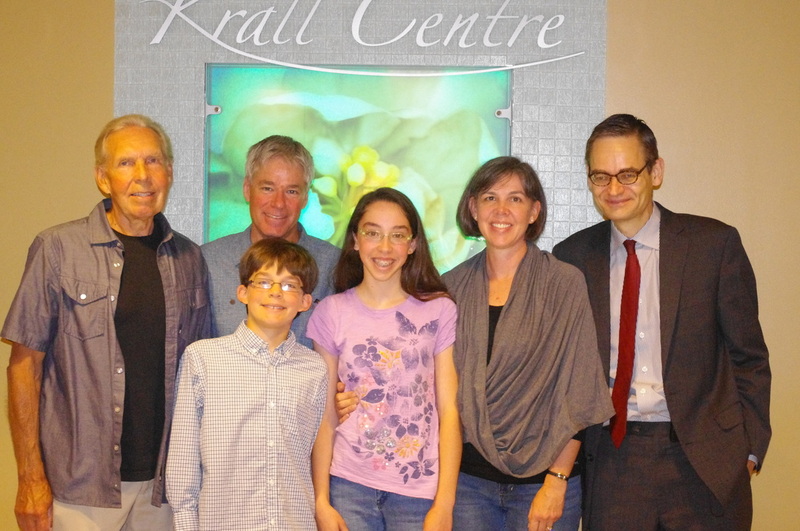 Dr. Michael Barnett showing the Warren family around the Hematology Research and Clinical Trials Unit (HRTCU) at the Vancouver General Hospital in August 2013. The Hematology Research Program (HRP) (formerly the Hematology Research and Clinical Trials Unit) is the leading program in Canada for developing and testing new treatments for blood disorders, including cancers such as myeloma, leukemia, and lymphoma. The HRP has doctors, research scientists, nurses, and support staff to conduct clinical trials and study the effectiveness of new drugs, or even new combinations of drugs, as they come available. When Chad was diagnosed with multiple myeloma in 2001, there were few effective drug treatments. Thalidamide provided temporary relief for some, but there were significant side effects. Then came Revlimid and Velcade, and now pomalidomide is showing promise. Chad's Mom, Sandy, was one of the first myeloma patients in Vancouver to try Revlimid in a clinical trial at HRP in 2005, and the medication kept her cancer at bay until 2014 - the longest the drug has worked for any of her doctor's patients. Now Sandy is taking a combination of chemotherapy and Velcade to get her myeloma cells back under control. transplant centre in British Columbia. The HRP blends clinical work and patient treatment, with research. During the trial period, the drug is free to the clinic to use - saving the cost of $9,000 per month for one patient during the trial. When the researchers find new treatments that are more effective than current treatments, the Unit makes a case to the B.C. Cancer Agency, and if the evidence is there, the treatment becomes funded as part of the health care system and available to future patients. This makes the HRP attractive to pharmaceutical companies which want their drug to be evaluated. The Unit is also the envy of other research bodies. The HRP serves a defined population and can conduct population-based studies - a cost-effective way to provide evidence-based information and treatments that can be generalized to the entire population. A nurse at the HRCTU Thrombosis Clinic shows Chad's nephew how patients are taught to manage blood clots. Cancer patients, particularly myeloma patients, have a higher risk of stroke than the general population. patients are now routinely given Velcade before a bone marrow/stem cell transplant because HRP research shows that the transplants are more successful with the pre-treatment. receiving a bone marrow or stem cell transplant is now an outpatient procedure. When Chad and Sandy had their transplants, they were in hospital for 30 to 40 days. Now, 80% of patients recover at home. Chad endured a combination of near-lethal total body irradiation and chemotherapy cocktails to kill his white blood cells before his transplant. Now patients receive one type of high-dose chemotherapy. when some of the HRP doctors started their careers, the life expectancy of myeloma patients was two or three years - now patients can live for decades. stem cell transplants are now more common than bone marrow transplants. Many donors no longer need to give bone marrow via spinal tap. Instead, stem cells are spun out of the donor's blood. It's faster, painless, and doesn't require anesthetic or an operating room. Myeloma affects each patient differently. For instance, the treatment that worked for Chad's Mom, did not work for him. The doctors at HRP hope one day to understand the genetics of the patient and the genetics of their disease so they can target the treatment by understanding which drugs the patient will respond to. have doubled within the last decade. The HRCTU needs about $450,000 to operate each year and most of it has to come from donations. That money would give the program stable funding and allow HRCTU to continue to focus on new and more effective treatments for blood diseases such as multiple myeloma, leukemia, and lymphoma. Chad's goal of $1 Million is to help the HRCTU with funding to carry out its critical work for years to come. The Statistics on Blood Cancers in B.C. HRP has directly provided more than 700 patients with new treatments before they became available to all patients through the BC Cancer Agency. 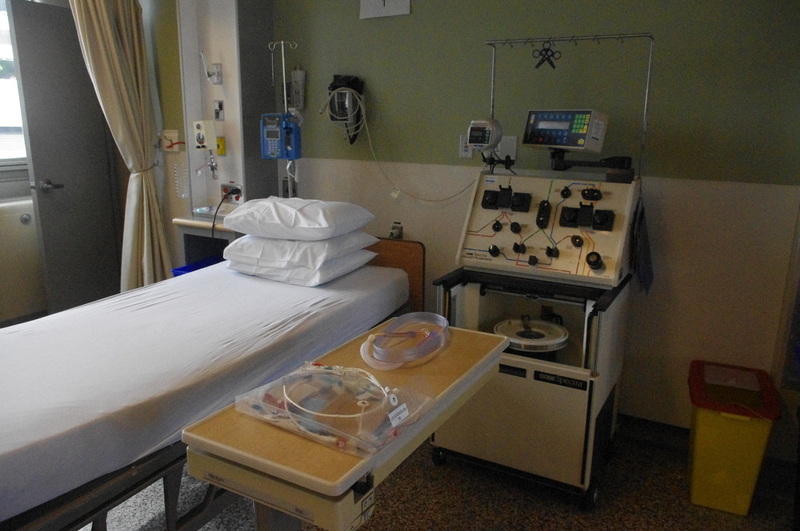 A bed set up for apheresis: where blood is temporarily withdrawn, one or more components are removed, and then it is retransfused into the patient. Apheresis can be used to harvest stem cells, or to separate out unhealthy cells for removal or treatment. My mother and I have shared this disease for almost the same length of time. I was diagnosed in May of 2001 while she followed one year later in May of 2002. On a side note, my father was diagnosed with Renal Cancer in February of 2002. He had immediate surgery to remove his tumorous kidney and was back hiking the North Shore mountains four weeks later. So the point is: are these incidents related? At this time there is no confirmed scientific proof that any of this is genetic. I would tend to disagree, but without any scientific evidence my family will continue to live in fear. My older sister, Jennifer, is healthy and has two amazing kids. I can’t imagine the fear she must be living with hoping and praying her family will continue to stay healthy while watching the rest of her family battle this mystery. If multiple myeloma turns out to have genetic links and the only thing stopping researchers and doctors from pinpointing its origin is lack of funding, I can’t accept that. If multiple myeloma turns out to have genetic links and the only thing stopping researchers and doctors from pinpointing its origin is lack of funding, I can’t accept that. There are thousands of horrible debilitating diseases out there, some receive awareness and funding, some do not. multiple myeloma has no cure and it is my dream/mission to ensure a cure is found so my niece/nephew and maybe someday my own children won’t have to inherit this life. I’ve heard that the cure for cancer is prevention which I believe to be a true statement. We need to continue funding to discover its origin so one day we can test high risk candidates and catch this disease before it consumes another life. We need to continue funding to discover its origin so one day we can test high risk candidates and catch this disease before it consumes another life.